When someone's eyes dilate, their pupils get bigger or smaller, but they always stay the same shape. Dilation in math is very similar. When you dilate a figure, you change the size of the figure without changing its shape. This tutorial introduces you to dilation. Take a look! How Do You Multiply a Whole Number by a Fraction? Multiplying a whole number and a fraction can be confusing, but this tutorial helps to sort things out. Check it out! Ratios are everywhere! The scale on a map or blueprint is a ratio. Ingredients sometimes need to be mixed using ratios such as the ratio of water to cement mix when making cement. Watch this tutorial to learn about ratios. Then think of some ratios you've encountered before! Just about everything in math has a name! Did you know that when you're dealing with transformations, the new figure you get is called an image? Check out this tutorial and learn about this math term! 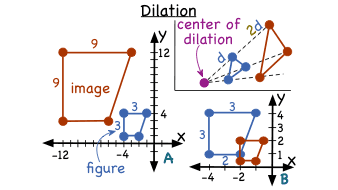 How Do You Make a Figure Larger Using a Dilation? Dilation allows you to shrink or enlarge the size of a figure without changing its shape. In this tutorial, follow along as you see how dilate a figure by a given scale factor. Check it out!